Soothes and hydrates your skin. Clarins Sun Cr. 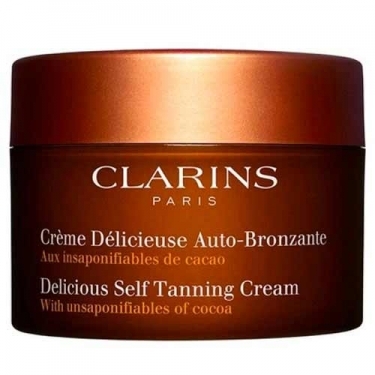 Délicieuse Auto-Bonzante (Delicious Self Tanning Cream) is a self-tanner especially formulated with cocoa bean extract to hydrate and prevent aging. Also combines aloé vera plant to moisturize and regenerate your skin. Apply generously over the face and body. Avoid the eyebrows and hairline. Wash hands thoroughly after application.